Anthony Precourt got his stadium deal in Austin on Wednesday thanks to a 7-4 city council vote. He won. Precourt wasn’t the only winner, though, because hopefully Columbus Crew fans have seen the last of him forever. The city of Austin willfully chose to partner with a man who has proven himself to be one of the worst and least trustworthy owners in America in their quest to bring major league sports to the city. In spite of the many stumbles and self-inflicted wounds of Precourt Sports Ventures, the stadium deal limped over the finish line and Precourt will have his dream stadium site in Austin at a former toxic waste dump ten miles from downtown. There were two seminal moments Wednesday in Austin that came after the city council meeting that symbolized the journey #SavetheCrew fans have been on the last ten months. 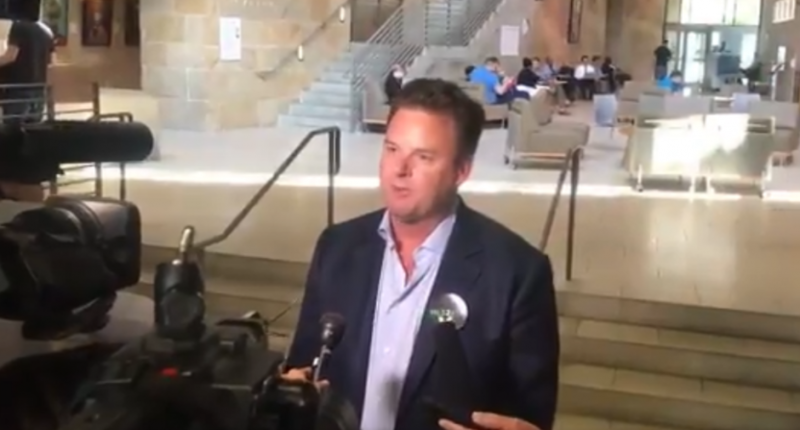 One was when Precourt addressed the local media after the council meeting. Precourt was asked what must have been a surprising question considering the occasion – what would his message be to soccer fans in Columbus? He paused, as if to take one last moment to look within and see if there was just one ounce of integrity, empathy, or compassion within him to share with the fans that he has betrayed and decided that there indeed was not. He merely gave an awkward glance to the side and slithered back into his hole. It was telling who else was silent on Wednesday – Major League Soccer. The league released no statement or comment upon the council’s decision in Austin, merely choosing to re-post statements from PSV on its league website. And really, what could MLS say in this moment? What could they say to fans in Columbus and around the league? Would it be a warning to Chicago and Colorado that they better start filling seats or they’ll be next? Would it be to tell fans in Columbus that Cincinnati isn’t that far away and they should just get over themselves? Would it be to sponsors in every market to pony up a few more million so their own city’s “business metrics” don’t fall under the microscope? Would it finally be an admission of the league’s depth of hypocrisy? Perhaps silence was their best option. If this is how MLS is willing to treat Columbus, a city that was the first charter member of MLS, that committed to building the first soccer-specific stadium in the league, that has been the go-to home for the USMNT, then why would any fan expect anything different? Why would any fan expect anything better than deafening silence in their own time of need? Major League Soccer should scrap this “for community” nonsense and tell the truth – they are for nobody but themselves and their “investor/operators.” The Columbus soccer fan is as easy to disregard and throw away as the last remnants of toilet paper on the roll or the lint between your couch cushions – just like the NBA fans in Seattle or the NFL fans in St. Louis and San Diego and Oakland or the baseball fans in Montreal or anyone else. At any step of the way, MLS could have stepped in and stopped this thievery. They could have thrown their support behind #SavetheCrew and embraced one of the great fan-led stories in modern sports that is drawing support from around the globe. Instead, they have pretended that it simply doesn’t exist. Through their silence, MLS is telling fans that their fandom is meant to be taken for granted, used and abused, until something better and sexier and richer comes along. Fans can be cheated on, lied to, ignored, and treated with brazen and utter contempt and it just does not matter. Anthony Precourt has done all of those things to the city of Columbus and he has done so with the blessing of Don Garber and everyone involved in MLS. Look no further than Precourt’s empty “commitment” to growing women’s soccer in Austin to get his deal over the line when the WPSL’s Columbus Eagles confirmed that PSV had never once partnered with them in Columbus. Anthony Precourt is not suddenly a champion of equality in soccer. It was merely a means to an end. Regardless, the #SavetheCrew fight will continue thanks to the Modell Law in Ohio and the ongoing lawsuit to keep the team in Columbus. This story is far from over. The work that volunteers in Columbus have done to garner season ticket pledges under new ownership, help people in their community, and even coming up with drawings for a new downtown stadium continues to be extraordinary. At least there has been one person to take notice of the #SavetheCrew movement, though, and she came from the last place you would expect. Austin city council member Leslie Pool has long been the biggest critic of the stadium deal in Austin, but she also took an extraordinary step this week. On her own dime, she flew to Columbus to meet with Save the Crew leadership, the people who have been so deeply affected by the betrayal of PSV and MLS. Through that simple act of reaching out and having a conversation, Pool showed more compassion and empathy for soccer fans in Columbus than Anthony Precourt or Don Garber ever have. How impossibly ironic is it that a council member from Austin, Texas has done more for soccer in Columbus in the last ten months than the entirety of Major League Soccer? At least Pool understands that fandom isn’t just numbers and empty promises. Fans are actually real people that have invested a part of themselves in something that brings them together and something they believe in. That’s why #SavetheCrew will ultimately emerge triumphant when the ghost of Anthony Precourt is nothing but a distant memory in the Buckeye state. Whether it ends with an MLS team in Columbus or not, #SavetheCrew will endure beyond a vote in Austin or a lawsuit in Ohio or whatever comes next. The #SavetheCrew movement is about more than just keeping a beloved sports team in town – it’s about building and bringing together a community. It’s supposed to be what Major League Soccer stands for, after all. But it’s not their values to own and decide who gets to partake when and where and for how much money. And it never will be. It’s something that belongs to all soccer fans. All sports fans. It is a sense of camaraderie that brings people together through the ups and downs, wins and losses, and everything in between. It’s something that endures. And it’s something Anthony Precourt and Don Garber can never take away, no matter how hard they may try.